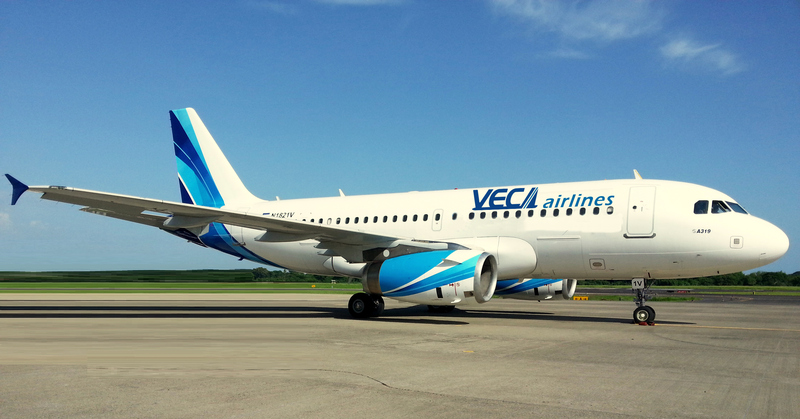 VECA Airlines operates two Airbus A-319s. SAN JOSE, Costa Rica–Salvadoran Low Cost Carrier (LCC) VECA Airlines landed at Juan Santamaria International Airport last February 27th. The airline will operate three times a week a flight from Guatemala City via San Salvador with an Airbus A-319 for 144 passengers in one single class. The airline is expected to offer excellent fares and compete with both Avianca and COPA Airlines. In 2009 the Colombian airline Avianca purchased GRUPO TACA and for a while the new airline operated as AviancaTACA but in 2013 the airline changed its name again to just Avianca. The Central American communities in the United States and Canada lost the emotional connection they used to have with the Salvadorian flag carrier that started in 1931 and now expect VECA Airlines to fill the void. Non official versions insist that VECA Airlines will start flights to Baltimore, New York, Houston and Los Angeles by the end of 2015 or beginning of 2016. The airline’s web site http://www.vecaairlines.com shows future services to Panama City from San Salvador. This entry was posted in Latin American Low Cost Carriers and tagged Avianca, AviancaTACA, Baltimore, COPA Airlines, Houston, Juan Santamaria International Airport, Los Angeles, New York, Panama City, San Salvador, TACA, VECA Airlines.